Cole Foster Grips Antique Grey Marble 1"
Antique Grey Marble, for 1 inch handlebars. Salinas Boy Cole Foster is famous for his steady hand, cool eye and unwavering attention to detail that he applies to custom motorcycles and hot rods. 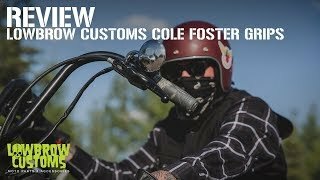 Inject a handful of King Cole's custom style into your chopper with Cole Foster Grips from Lowbrow Customs. These grips measure 4 7/8" long, sold per pair. 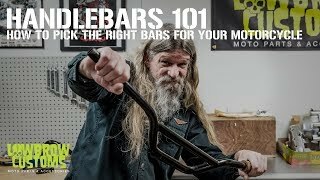 It is important to choose the proper size grips for your motorcycle. Grips are available in 1 inch (the size needed for all Harley-Davidsons and other 'cruiser' style motorcycles) as well as 7/8 inch (common on many vintage British, European and Japanese motorcycles such as Triumph, Honda and Yamaha). Please note that any pair of motorcycle grips has two different inside diameters. The grip for the left side (as if you were sitting on the bike) of the handlebar has a smaller diameter, and the right side grip has a larger inside diameter to fit over your throttle tube. Grips are manufactured to have a tight fit, you don't want one sliding off while taking a corner or twisting the throttle! They are easy to install using a bit of WD-40 to help get them in place. Alternatively, you can use compressed air as seen in our Basic Motorcycle Grip Info & Install video. Gnarly, absolutely love these grips. Great product! Looks good on the bike. My RK is white, seat grey and snakeskin. These Antique Grey Marble grips just top it off. I'm on my second pair, first pair was still going strong after 3 years. Just put another set on because I installed new bars. The wife has the moca colored grips on her ride. She's on her second set because of the same thing- new bars.